Yes, you can have children after cancer. 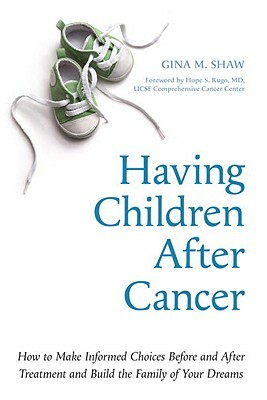 With a foreword by top oncologist Hope Rugo of the UCSF Cancer Center, this first and only cancer-and-fertility guide for patients and survivors will allow you to be your own best advocate throughout the journey. GINA SHAW, a health and medical writer, was newly married and trying for a baby when--at age thirty-six--she was diagnosed with breast cancer. Now, seven years later, she's a survivor and proud mother of three children, both adopted and biological. Gina chronicled her journey through breast cancer for Redbook in a five-part diary series. She won the Society of Professional Journalists' award for a WebMD series and the Association of Women in Communications' Clarion Award for another Redbook series, "The Fertility Diaries." Her articles have also been published by Ladies' Home Journal, Fitness, and Woman's Day. She lives with her husband and children in Montclair, New Jersey. Winner: Honorable Menition in the Service/ Self-Help Category.